Although I don't currently use fondant/sugarpaste for my cakes, I love to look through cake books by Debbie Brown. Her cakes provide some wonderful inspiration for my own creations (as seen with my Baby Dragon cake). 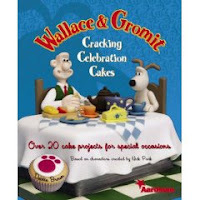 I recently visited her website to see a list of her publications and came across a new book, Wallace and Gromit Cracking Celebration Cakes: Over 20 Cake Projects for Special Occasions (Hardcover). It is a wonderful collection of Wallace & Gromit themed cakes! There are several for the beginner and others for the more experienced (such as the cake pictured on the cover). And there are plenty of detailed instructions and color photos to assist you through the decorating process. There are also simple fairy/cup cakes and mini cakes. You'll find cakes from all the Wallace & Gromit short films as well as from the recently released "Curse of the Wererabbit". I have yet to make one of the "Cracking Good" cakes, but in the meantime, it is definately a fun cake book to look through. Watch out, though...if you are a Wallace and Gromit fan/cake decorator like me, this is one book that may cause you to have a "gotta have it" moment, too.